A profit & loss report provides information on your financial performance; how much money have you made? How much did it cost you to make that money? What do you have left over after paying all your out-goings? When you look at a profit & loss report, Brightpearl will check all the transactions in the sales and expense accounts to see how much profit has been made; your "bottom line" (If you sell inventory, then you will need to make sure that any change in the cost value of your inventory is included in any profit & loss report otherwise the figures will not be correct. Talk to your accountant or book-keeper for more information on inventory valuation). To view your profit & loss report, go to Reports > Profit & loss . Brightpearl automatically displays 4 periods of 1 month (the current month plus 3 previous months) profit & loss statements. Use the filters to view statements as of a specific date, for a particular department, project or lead source. When cost of sales accounting is active cost of goods sold journals are always created when the items are marked as shipped. However, you may choose when the values are recognized on your profit and loss using the accounting settings. This setting will affect when cost of goods sold is posted for items shipped after the order has been invoiced. Choose yes: If you want cost of goods sold to be posted on the invoice date, and therefore reported in the same period as the revenue (accounting period must be open). When the order is invoiced the SI journal will be posted and the accounting recognized as of the invoice date. When the items are shipped, the GO journal will also be posted using the invoice date. Note that this will not affect the inventory audit trail, which will show the actual date the items came out of stock. This will result in the revenue (SI) and cost of sales (GO) applicable to that sale being recognized on the profit and loss report on the same date, even if they didn't occur on the same date. This will provide an accurate profit/loss for that period even when invoicing and shipping occur in different periods. Choose no: If you want cost of goods sold to be posted on the shipping date. When the order is invoiced, the SI journal will be posted and the accounting recognized as of the invoice date. When the items are shipped, the GO journal will be posted and the accounting recognized using todays date (the shipped date). When invoicing and shipping occur on different dates, this will result in the revenue (SI) and cost of sales (GO) applicable to that sale being recognized on the profit and loss report on different dates. Where invoicing and shipping occur in different periods the profit and loss report will show the revenue in one period and the cost of goods sold in another period. This setting will affect when cost of goods sold is recognized for items shipped before the order has been invoiced. Choose yes: If you want cost of goods sold to be recognized on the same date and be reported in the same period as the revenue. When the items are marked as shipped the cost of sales value will be posted to the deferred COGS nominal code. When the order is invoiced this deferred cost of sales value will be moved from deferred to the product cost of sales nominal code. When the items are shipped, the GO journal will be posted and the accounting recognized using todays date (the shipped date), but the cost of goods value will be posted to a deferred account code (liability) so that it can easily be discounted from the profit and loss report until the order is invoiced. 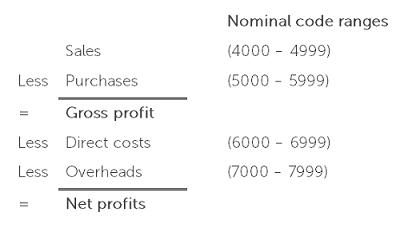 Note that the deferred cost of goods sold is defined at Settings > Company > Accounting: Nominals. When the order is invoiced, the SI journal will be posted and the accounting recognized as of the invoice date and additional GO journal is posted to take the deferred cost of goods value and post it to the cost of goods sold account code as of the invoice date. This will result in a deferred cost of goods sold value appearing on the balance sheet report up until the order is invoiced. Once the order is invoiced the revenue (SI) and cost of sales (GO) applicable to that sale being recognized on the profit and loss report on the same date. This will provide an accurate profit/loss for that period even when invoicing and shipping occur in different periods. Choose no: If you want cost of goods sold to be posted at the date/time the items were shipped. Where shipping and invoicing in different months the revenue and cost of sales will be reported on the profit & loss in different months. When the items are shipped, the GO journal will be posted and accounting recognized on todays date (the shipped date). Where invoicing and shipping occur on different dates, this will result in the revenue (SI) and cost of sales (GO) applicable to that sale being recognized on the profit and loss report on different dates. Where shipping and invoicing occur in different periods the revenue and cost of goods sold will be shown on the profit and loss report in different periods.